Although observations from SWOT will be tremendously important for hydrologic science, there are certain limitations. One is the discontinuity in space and time of SWOT-derived water surface elevations, discharge and storage change. Due to the orbital characteristics of SWOT, water bodies will be observed between 2 and >10 times per cycle depending on latitude. For example, the number of observations in the Amazon River basin will range from 2-4 times per repeat cycle whereas the Lena River will be observed 4-10 times. This could prove problematic when attempting to derive aggregate (weekly, monthly or seasonal) estimates of river discharge for instance, or lake, reservoir, or wetland storage change. For example, if a given river is sampled only twice per repeat cycle and those observations coincide with peak (low) flows there will be an over (under)-estimation of discharge. A methodology to generate products with spatially and temporally continuous fields of SWOT observables would be highly desirable. Data assimilation is such a methodology; it can merge observations from SWOT with model predictions in order to produce estimates of quantities such as river discharge, storage change, and water heights for locations and times when there is no satellite overpass or layover renders the measurement unusable. Develop a framework for generating a Level 4 SWOT data product that provides continuous fields of water surface elevation, discharge, and storage change. Evaluate data assimilation algorithms for SWOT observations. Quantify errors in estimating water availability from using the Level 3 and 4 products. Evaluate whether SWOT observations can be used to estimate human impacts on the water cycle (e.g. reservoirs, diversions). Derive a dataset of runoff fields and demonstrate its value by calibrating a hydrology model against it. Our overall approach to developing a modeling and assimilation framework for generating high-level SWOT data products consists of the coupling of a hydrologic and hydrodynamic model and their modification so that SWOT observations can be assimilated. The experimental design (identical twin synthetic experiment) starts with the coupled model generating "true" fields of surface water variables (e.g. water height, discharge, storage change, and runoff) using a baseline configuration. The "true" fields are then used to generate synthetic SWOT observations over the study areas with the proper orbit and accuracy characteristics. The latter are defined using the SWOT Instrument Simulator. A "first-guess" (or open-loop) simulation was also performed with the coupled model using a configuration that contains errors representing the imperfect knowledge of parameters and input data. Subsequently the synthetic SWOT observations were assimilated into the open-loop model to estimate discharge and storage change. Finally, the output of the assimilation model is compared with the designated “true” fields in order to validate the approach. Figure 1: Map of the Upper Mississippi River basin and its topography, along with the simulated rivers. The coupled modeling framework consists of the Variable Infiltration Capacity (VIC) hydrology model and the LISFLOOD-FP hydrodynamic model. VIC solves the land surface energy and water balances over a gridded domain using a soil-vegetation- atmosphere scheme that models how moisture and energy fluxes between land and atmosphere are controlled by vegetation and soil. One of the model’s advantages is its representation of sub-grid variability in soils, vegetation and topography via the partitioning of each grid cell into tiles of uniform physiography. Although VIC includes a simple flow routing model that transports the generated runoff and baseflow of each grid cell through the river network, it has certain limitations that preclude it from being used in conjunction with SWOT observations. LISFLOOD-FP overcomes these limitations and simulates water flow through each model grid cell by solving the inertial momentum equation through a single explicit finite difference scheme. The resulting model is simple yet contains enough physics to describe flood and river flow processes adequately while requiring an order of magnitude fewer computational operations than a full shallow water model. 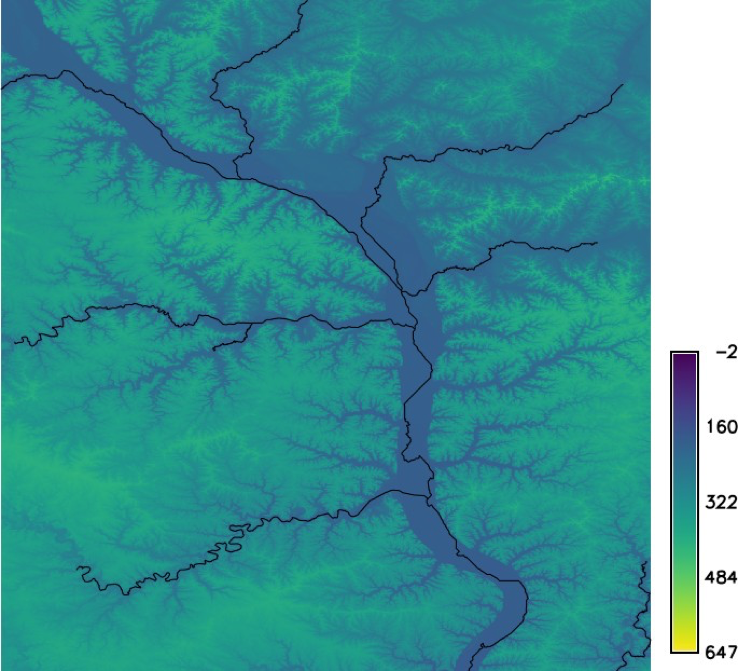 The study domain for the first experiment is the Upper Mississippi River basin (Figure 1), and the coupled model was used to simulate hydrodynamic variables at 1-km spatial resolution. The "truth" model uses the National Elevation Dataset (NED) DEM to derive the river network (thresholded at 10,000 km2 drainage), river channel widths and depth from the HydroSHEDS database, and inflows simulated by VIC using meteorological data (precipitation, air temperature, and wind speed) at 1/16°. The open-loop simulation uses a DEM derived from the Shuttle Radar Topography Mission (SRTM), and adds errors to the bankfull widths and depths as well as the inflows creating an ensemble of 20 model trajectories. The "truth" model simulation was able to reproduce river discharge with reasonable accuracy over a 3- year time period (selected to match the design life cycle of SWOT). Figure 2 shows a comparison of the "truth"-simulated discharge with actual measurements from a USGS gauge. 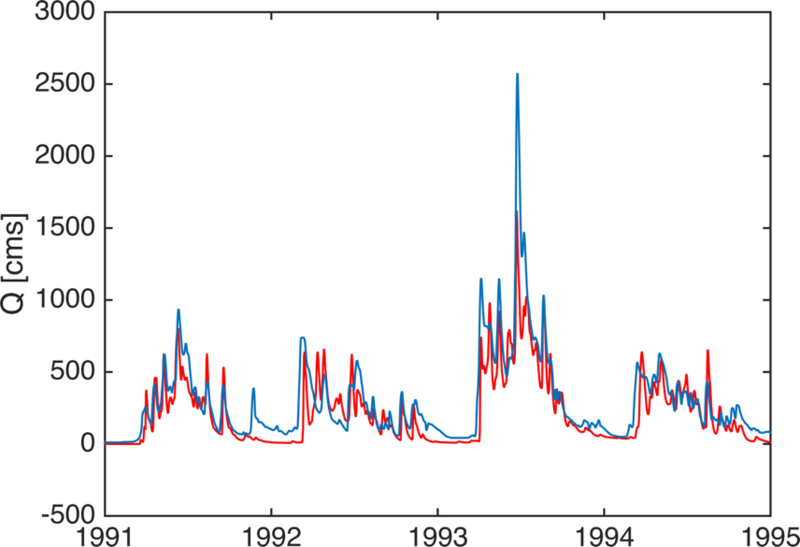 Figure 2: Validation of the "truth"-simulated (red line) river discharge against in-situ measurements (blue line). The "truth" water surface elevations (WSE) were used as inputs to the SWOT Instrument Simulator to produce the synthetic observations. In order to correctly represent errors from topographic layover (among other errors), the 1-km WSE fields were deemed inadequate and were subsequently downscaled to a 30-m spatial resolution. The synthetic SWOT observations are the assimilated into the open-loop model by using a number of algorithms that are variants of the Ensemble Kalman Filter (EnKF). The EnKF, and the Kalman Filter in general, solve the optimal estimation problem by updating the model state based on the errors of both the model predictions and the observations. The uncertainty in the model and the observations is represented through an ensemble using a Monte Carlo approach and a-priori assumptions about the statistics of these errors. The algorithms tested include the EnKF, the square-root EnKF (SQRTENKF), and the Local Ensemble Transform Kalman Filter (LETKF). The SWOT Instrument Simulator is relatively expensive computationally, and given the size of the study domain we are testing an approach to approximate the errors at the 1-km scale. The approach involves the selection of representative subdomains, which make running the Instrument Simulator more tractable, and the derivation of probability distribution functions (PDF) of the errors (after being aggregated to 1-km) conditioned to physiography (topography, river width, land cover). The error PDFs then are used to sample errors for the entire domain, matching the orbital characteristics (i.e. spatial coverage) of SWOT. Figure 3 shows an example of the generated synthetic SWOT observations for a number of passes over the study domain. Figure 3. Example elevation maps over Upper Mississippi River basin for different satellite overpasses. An important aspect of the data assimilation algorithms is the definition of the observation operator (i.e. the mapping functional between the predicted variables and observations). In the case of hydrodynamic modeling, this becomes complicated due to the errors in river topology between the "truth" and open-loop simulations. In addition, the experimental design introduced errors in multiple parameters (inflows, channel width and depth, roughness) making the assessment of SWOT data assimilation more realistic than previous and current work. In order to account for the differing river topology, we performed the assimilation in "reprojected" coordinates expressing the variables in terms of flow distance. Figure 4 shows a comparison of the three data assimilation algorithms with the open-loop and "truth" simulations in terms of the downstream profile of WSE of a river reach of the Missouri River. The LETKF appears to outperform the other two Kalman filter variants by better reproducing the pools, which could be attributed to the localization inherent in the algorithm. Nonetheless, all assimilation algorithms improve the estimation of WSE over the entire length of the river reach, when compared with the prior estimate. Figure 4. Comparison of algorithms assimilating synthetic SWOT observations with respect to water surface elevation spatial profiles over a reach of the Missouri River on specific date. We expect to test and establish a robust modeling and assimilation framework for SWOT observations, and demonstrate its feasibility for operational implementation over continental-scale river basins as well as globally. The added value of the higher-level versus the instantaneous (Level 2) data product will be assessed by calculating and then comparing temporally-aggregated discharge and storage change for weekly, monthly, and seasonal periods. The evaluation of the product will also be performed separately for rivers, lakes, wetlands and reservoirs and the errors will be linked to characteristics such as basin physiography, river channel width/slope etc. providing some insight into the expected errors in areas other than our test cases. The framework we are developing will produce temporally continuous estimates of discharge that can also be used to calibrate the VIC hydrology model. Streamflow is the response of the integration of runoff in space and time (mathematically represented by the routing model). Hence, runoff fields can also be used to calibrate hydrologic models (on a grid cell by grid cell basis for spatially distributed models). The derivation of runoff fields from SWOT observations could greatly facilitate hydrologic model calibration, which is in many respects the Achilles Heel of hydrologic modeling. Runoff, the key quantity produced by spatially distributed models, is not directly observed, and instead streamflow measurements are typically used, which has many drawbacks (including poorly posed model identification, which can result, for instance, in “cliffs” at basin boundaries. Streamflow is an integrated measure of the hydrologic processes of the river basin; hence the hydrologic signal at the outlet (or streamflow measurement location) loses any spatial and temporal information upstream at smaller or shorter scales. The work of this project could alleviate these limitations by facilitating and allowing the estimation of spatially distributed model parameter as well at ungauged basins.